A lavish Tolkowsky 18ct white gold 1ct diamond ring, exquisitely crafted with a sparkling double diamond halo, and diamond encrusted shoulders. As the inventors of the Ideal Cut, Tolkowsky adheres to the highest standards of quality with diamond centre stones that achieve the best combination of fire, brilliance and sparkle within the diamond. 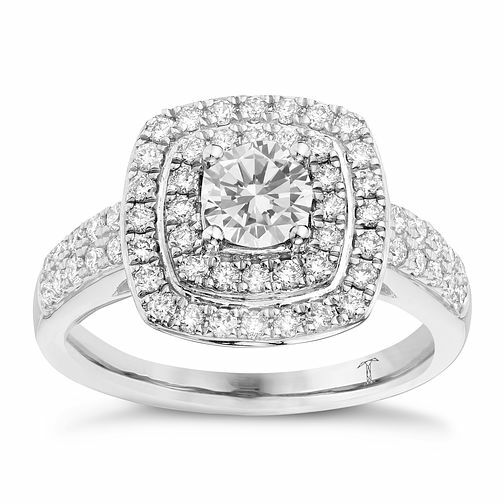 Tolkowsky 18ct white gold 1ct I-I1 diamond halo ring is rated 5.0 out of 5 by 2. Rated 5 out of 5 by Anonymous from Beautiful dimond ring My husband bought this beautiful ring for me today I absolutely am in love with it. It sparkles beautifully. My husband bought in confidence knowing that it's the best chosen dimonds in the world and is crafted from towlkosky and is certificated is great. I'm in love with my ring and my husband. ? Rated 5 out of 5 by Anonymous from Stunning! My (now) fiance bought this for me last night and I can't stop looking at it! Absolutely gorgeous ring. If you want 'sparkle' and a real feel good feeling this is for you!!! !